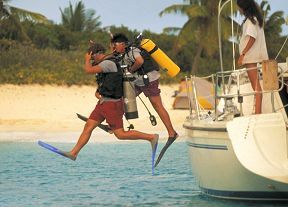 Experienced Divers - Consider a vacation that expands your sea horizons! Depending on your desires, there are many choices around the world, and some may be close to home. Here are some ideas, and questions to ask yourself. Hammerhead sharks? Cocos Island in Costa Rica or closer, The Sea of Cortez. Want to dive around the clock? Live Aboard Dive Boats operate almost everywhere including the above. Try a 3 day trip off the California coast to get you started. Go to Hawaii (Lanai has expeditions, nightdives, coral canyons) Lanai Resorts (800 321-4666), Sheraton Kauai Resort (800) 782-9488), or visit the Kauai website. Or the Grand Caymans or Bermuda (1-800 Bermuda). With some careful preparations you could have an amazing adventure on a diving vacation. Scuba, which is the acronym for Self-Contained Underwater Breathing Apparatus, refers to a type of diving in which participants wear tanks carrying a supply of either pressurized air or a mixture of oxygen and other gases. A breathing regulator and pressure-reducing mechanisms work together to provide air to the diver with each inhalation. Other scuba diving equipment include masks, fins, snorkels, booties, wet suits, and instruments for keeping track of depth, air, and time. Scuba diving is practiced as a recreational sport as well as a means of conducting military and scientific research. This section showcases diving associations and organizations.